Size: 6" 8" & 10"
- Capacity : 2, 500 qubic/hr to 1, 75, 000 qubic/hr. - Static Pressure : 5 mm WG to 60 mm WG. - Application : Air Supply, Air Exhaust, Air Distribution. We are one of the renowned supplier of Agriculture Fan. We provide this product at a reasonable price with the best quality. 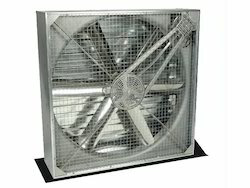 Our organization is involved in manufacturing and supplying a wide range of Ventilation Fans that are made using superior quality blade and other components. These type of fans are used for several purposes like ventilating stores, shops, offices, malls, factories and farm house buildings.